Our shops rely on your generous donations of good quality clothing and household items. It's easy to donate, knowing that your second-hand goods will help people in need in communities everywhere. With over 50 Red Cross shops throughout NZ, donating clothing and goods to our shops directly helps your community. We welcome quality clothing, furniture and homeware donations. Different shops stock different things - take a look at your local shop's page to find out what they accept. Simply drop your donations off during shop hours or call your local shop to arrange a collection. We are happy to have the support of Kathmandu stores accepting donated goods for our Red Cross Shops. Kathmandu stores throughout New Zealand have donation boxes where you can take your good quality goods and they will pass them on to us. We’ve joined forces with Country Road to reward you for your social conscience. 'Fashion Trade' rewards customers for donating pre-loved Country Road clothing and accessories to Red Cross Shops. Donate your pre-loved Country Road items to your local Red Cross Shop and we’ll give you a $10 discount card that can be redeemed in a Country Road store, when you spend over $50 with them. More details are available at your local Red Cross Shop. On the day that David Bowie passed away, Claire Sewell found a seemingly random but ideal item at her local Red Cross shop. 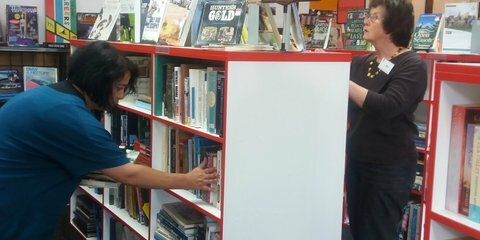 In the back of the New Zealand Red Cross building in Palmerston North, a small army of volunteers is busy sorting books.